Shiny thought she had joined us, but no one could see her. Does anybody know who Your Teacher is? Does someone have something that could help me with anything? Even if a compound pronoun seems to refer to more than one thing, when it is the subject of the sentence the verb is treated as singular. Everybody enjoys a good meal. The following indefinite pronouns need to be handled with care. They are often used as expressions of quantity, and refer to a specific noun which should have already been mentioned. These indefinite pronouns can refer to singular or plural nouns or verbs. Singular - any pronouns or verbs used to refer to them should also be singular. Plural - any pronouns or verbs used to refer to them should also be plural. 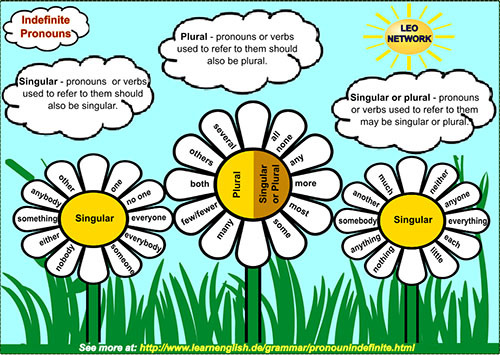 Singular or plural - any pronouns or verbs used to refer to them may be singular or plural. I offered her another (cup of tea). Both (of the teachers) were hired. Most (of the wine) was red. Some (of the jewellery) is fake. Most (of the passengers) were drunk. Some (of the strays) were rehoused. Once there were four managers. Their names were: Somebody, Everybody, Anybody, and Nobody. They were very busy people, but whenever there was an important job to be done, Everybody was sure that Somebody would do it. Anybody could have done it, but Nobody did. When Nobody did it, Everybody got angry because it was Everybody's job. Everybody thought that Somebody would do it, but No one realized that Nobody would do it. So consequently Everybody blamed Somebody when Nobody did what Anybody could have done in the first place. Now they all worked in the same company, and their company held a competition: Who could produce the best logo? Everybody had a good idea. Nobody thought nobody would follow it through. Somebody thought anybody could work on it. Anybody thought everybody should do it. Eveybody thought someone would do it. So nobody did anything. Everybody thought anybody could win something. Anybody thought somebody should win. Somebody thought everybody would win. Nobody thought nobody would win. What did they win? Nothing!